We just discovered the best dining deal in the Southcoast region in one of the most unlikely places. Cork, on New Bedford’s historic waterfront, has started offering a special called “Tuesday Tastings.” On the first Tuesday of each month, Cork is offering five tapas selections paired with five unusual wines for just $30 per person. Yes, that Cork, where a dinner for two with wine can easily set you back a hundred bucks under normal circumstances (mostly because you’re afraid of the word “tapas” and will order way too much food). The premise with this Tuesday thing is that they’re tastes — the servings of both wine and food are small. But these are extremely generous tastes, and unless your standard serving involves the word “bottomless,” you’ll like this. The Big Dog suggested that four friends join us, and those two other couples slid into their seats in the cozily refurbished historic building just as Sally from MS Walker Inc. started waving around a bottle of Espelt Vailet, a crisp white blend from Spain that for several of us was our favorite wine of the night. An equally crisp pinot grigio from Italy quickly followed, and Sally explained that while the Spanish blend was paired with the eggplant roulade and the pinot with the sauteed shrimp, we should mix and match. The two tastes arrived side by side on rectangular plates and got rave reviews from our party. 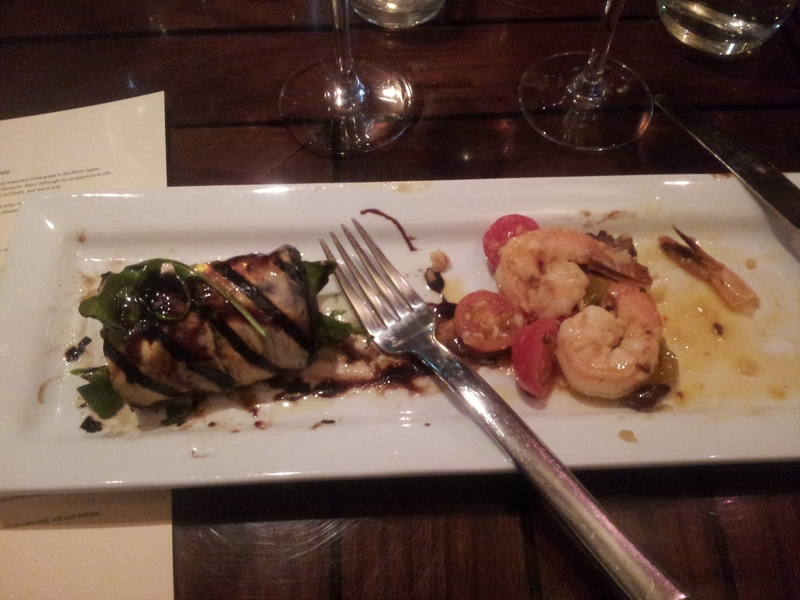 The grilled eggplant slices were artfully wrapped around chunky tomato slices (which Gina thought would have been better in the summer), goat cheese, and arrugula, and topped with a balsamic glaze that was thick and dark as chocolate sauce. Sauteed shrimp was a buttery melange of pancetta cubes and cherry tomato halves, made fiery — too hot for the Big Dog, who thought the heat detracted from the dish’s flavor — by sliced hot peppers. Next came two red wines, a tempranillo from Spain and a montepulciano, which like the pinot grigio was from Cantina Zaccagnini of Abruzzo, Italy. Both bottles came adorned with a sprig of grapevine that Sally said was affixed by the ladies of the village. The ladies of our village liked the montepulciano, despite the winemaker’s promise that it would taste like “a mouthful of leather” (and other things — you know how they are). The Spanish Vina Zaco was paired with a dish that was innocuously described as slow braised beef crostini with Great Hill blue cheese and chive oil. It was nothing to look at: two blobs of beef on toast. But its intoxicating scent preceded it, and the taste was pure heaven, its homey texture made rich with exotic spices. We tried in vain to identify the spice until finally, one of the waitstaff told us it was an Asian five-spice powder plus curry. We’re pretty sure the mention of curry was intended to throw us off course and prevent us from trying to make it at home. Lost in the furor over the braised beef was another dish that was pretty good. They called it a raviolone, which is apparently different from a raviolo (the singular of ravioli, of course) because it’s bigger. It was stuffed with an excellent sausage mixture and fried with panko. We ended with a painfully sweet pink sparkler, also from Italy, and a ball of chocolate chevre, probably excellent if you like that sort of thing, served with a little crostini over honey with sea salt. We enjoyed good company, five delicious dishes we might not ordinarily have tried, and tasty wines that were expertly paired with the food, all at an amazingly good price. The unobtrusive wine talk made it educational. If Tuesday nights depress you, as they certainly do us, we would encourage you to visit Cork for their Tuesday Tastings. Upon arrival for lunch at The Back Eddy one wintry Saturday afternoon, we were captivated by the view of the Westport Point harbor, and interesting waterfowl floating by. We’d been lured by the promise of “locavore” sensibility. We were charmed by the pleasant waitstaff. We relaxed in the spunky nautical decor. We were cheered by the Big Dog’s perfect black and tan, and Gina’s superb Vinabla malbec. But when the food started arriving, we were silenced. Reduced to an occasional, heartfelt “Yum,” the Dog said we should start our review that way. As we’ve observed before, waterfront dining is often a terrible experience. You’re paying for high rents, not experienced staff or quality ingredients. Ditto for the local food joints that are popping up everywhere. We’re fans of the concept, but face it: in a New England winter, we learn that seafood and turnips only go so far. Not at Back Eddy. No, no, no. Here, the elements come together so flawlessly that you’ll think of the spectacular view as the afterthought. It takes a back seat to the excellent food, a lot of which was sourced thoughtfully. The Big Dog opened with a bowl of turnip soup ($8). Sounds like something your Irish grandma would foist on you when you were sick, right? Well, Grandma would have enjoyed the sweetness of the pure white soup, but this bowl was tricked out with a garnish of shredded lobster and drizzle of truffle oil. We could smell garlic, but it was so subtle that we couldn’t tell where it was coming from. Gina started with the simple green salad ($7.50), pictured above. Yes, anyone can put perfect fresh greens on a plate. Anyone can dress them lightly with vinaigrette. Anyone can toss in some hearty, crunchy croutons. But if anyone can do it, why was this salad so unique? It was a salad you would make at home if you really cared about, and were trying to impress, your dining companion. When the pleasant young bartender returned to take our entree order, we made a pivotal decision that probably affected our whole view of the restaurant: We decided to split an entree. With prices soaring to the 30-buck range, two entrees would have put us over the $100 mark, which is a particularly pricey lunch when you’re on your way to a foodie Christmas party. (Hey, we’re doing a public service, keeping you informed.) But we probably would have chosen the same thing anyway, plus they brought out two plates without that “extra plate charge” nonsense, so we were particularly happy with our decision. Here’s what we got: A magnificent, moist grilled swordfish ($25), snuggled with melt-in-your-mouth brussels sprouts atop garlicky mashed potatoes. Alongside was a tangle of dressed watercress topped with a golden nasturtium. In the interest of research, we also ordered a side of slaw ($4). It was a brilliant, creamy celebration of cabbage, which Gina said was the best she ever had in a lifetime of searching for the perfect slaw. Not surprisingly, we’ve heard that The Back Eddy is tough to get into during the summer season. But they’re open year round, so go now. Right now. It’s not easy to find waterfront dining in the Southcoast area of Massachusetts, but Gina and the Big Dog are doing their best. A rare Saturday night journey into New Bedford was, well, weird. Our first stop was a place touted as the city’s hottest rooftop nightspot, and granted, it was early evening (7 p.m.), and hot nightspots aren’t our thing anyway, but we were alone with the bartender in a two-story space for much of our visit. In fact, we may have been the only living creatures on the whole street, one that is supposed to be the heart of New Bedford’s restaurant scene, on the nicest evening of the year so far. Our young waitress brought us a shiraz and a pinot grigio, and an order of sweet potato maki — an unadventurous but very tasty selection from an extensive sushi menu. Gina’s house salad was fresh and crisp, and the Big Dog’s caesar was doused with a good dressing and laden with parmesan. The Dog ordered scallop scampi, partly because it was so likely to have come off one of the boats that was sitting in front of us. It was a delicious version of the classic dish, with a smattering of sun-dried tomatoes and the same addicting crostini that came with his salad. Gina’s black pepper crusted swordfish special with grilled asparagus and mashed potatoes was perfectly prepared. But at the risk of sounding like we spend too much time in faux Italian chains where a serving includes multiple pounds of pasta, this was simply too little food for the hefty $27 pricetag. When seeking dining recommendations, we found that everyone in New Bedford began by identifying the likely age range of fellow patrons. So, lest you think that the Waterfront Grille is just for older folks like us, we would note that we ran into Big Dog Junior on our way out, dining on sushi with fellow 20-somethings. The indoor dining area is festive and sleek, with ample windows overlooking the harbor — likely a great place to watch the game while splurging on some excellent food. 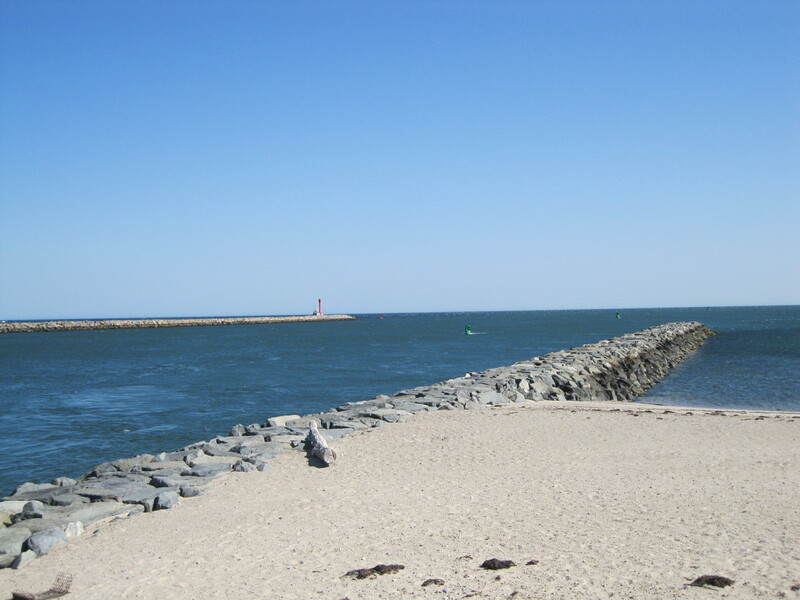 We love the Cape Cod Canal. It’s a stunning convergence of industry, technology, history, nature, and art. It’s a great place for a half-mile walk with a cranky old dog or a 14-mile bike/run(7 miles end to end). It’s a great place to catch a fish or a sunrise. It’s a great place to watch people, great blue herons, or barges. It’s just a great place. 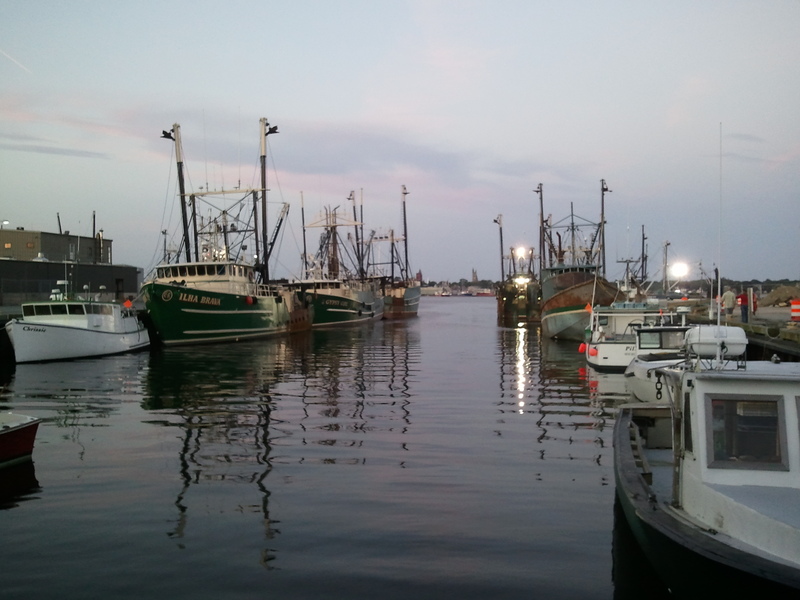 The few restaurants which take advantage of this engineering marvel are located at the eastern end of the canal, on the Cape side, and our favorite of these is Hemisphere. The view is spectacular, and the food is generally pretty good. But on a recent visit, a bottle of Malbec complimented a very good dinner. We started with fish nuggets: tasty morsels of haddock in a light, crispy batter, served with lemon and tartar sauce and plenty for two. The Big Dog had the stuffed chicken, kind of a twist on cordon bleu which he said was “neither too hammy nor too cheesy.” Gina ordered the seafood scampi, which came in a whiter sauce than the traditional butter and garlic preparation, over penne, but it was very good and loaded with scallops, shrimp, and lobster meat, along with fresh tomatoes. With the aforementioned bottle of wine, dinner came to about $85. Portions were generous: leftover scampi will make one of us a very large lunch. 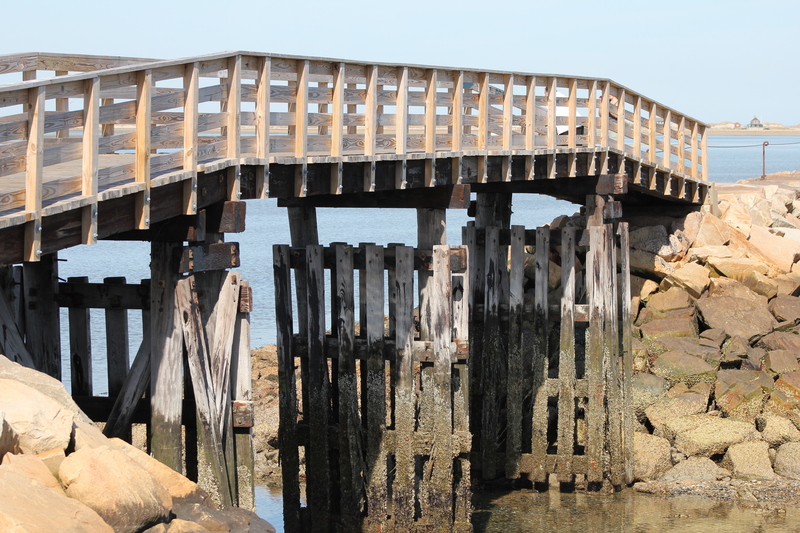 The unseasonably warm spring weather prompted us to head down to the Plymouth waterfront for lunch one Tuesday afternoon. Despite some interesting newcomers to the scene, we opted for an old standby: the East Bay Grille, and its beautiful outdoor pavillion-style bar. We know of some places that have a great view and nice decor and think that’s enough, but East Bay Grille also offers superb food at reasonable prices. Gina enjoyed a spicy chicken soup and her favorite, a beet salad with goat cheese. The Big Dog had a delicious kobe burger, cooked medium at the bartender’s recommendation and served with sweet potato fries. Both dishes featured top-notch ingredients, expertly prepared. Go ahead and order dessert (or, like we did, an extra sauvignon blanc for Gina and a margarita for Bo), then walk it off with a stroll on the jetty that extends into scenic Plymouth Harbor. It’s a little slice of heaven. You are currently browsing the archives for the Dining with a Great View category.